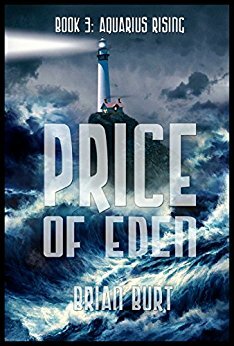 Update: The third and final installment of Brian Burt’s Aquarius Rising eco-fiction trilogy, The Price of Eden, has just been released from Double Dragon Publishing. Book 1, In the Tears of God, won EPIC’s 2014 eBook Award for SF, and Book 2, Blood Tide, won the 2016 Readers’ Favorite Gold Medal for SF. On an Earth ravaged by global warming, human-dolphin hybrids called Aquarians have built thriving reef colonies among the drowned cities of the coast. Now their world is under siege from an enemy whose invisible weapon leaves no survivors. 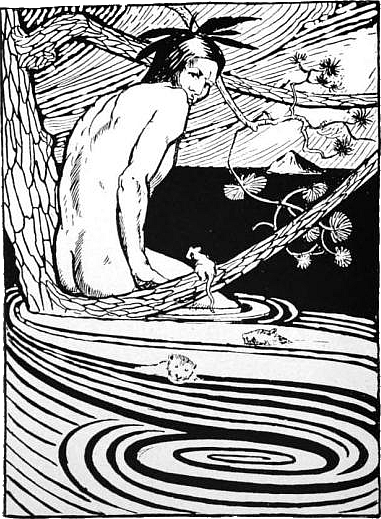 Only Ocypode the Atavism—half-human and half-Aquarian, marooned in the genetic limbo between species—knows why. Disclosing the reason could be as deadly to Aquarius as the Medusa plague itself. Ocypode and his comrades must face the perils of flight into the open ocean, a friend’s betrayal, a killer storm, a lethal kelp forest haunted by mutant monsters, and a fundamental challenge to their most cherished beliefs if they are to have any hope of saving Aquarius from destruction. On an Earth ravaged by global warming, human-dolphin hybrids called Aquarians have built thriving reef colonies among the drowned cities of the coast. Now their world is under siege from an enemy whose invisible weapon leaves no survivors. Only Ocypode the Atavism—half-human and half-Aquarian, marooned in the genetic limbo between species—knows why. Disclosing the reason could be as deadly to Aquarius as the Medusa plague itself. Ocypode and his comrades must face the perils of flight into the open ocean, a friend’s betrayal, a killer storm, a lethal kelp forest haunted by mutant monsters, and a fundamental challenge to their most cherished beliefs if they are to have any hope of saving Aquarius from destruction. They must enlist allies of the most unexpected sort from the most unlikely of places. Even then—when confronted by rogue scientists determined to resurrect the land by slaughtering the sea—it may not be enough. Winner of the 2014 Electronic Publishing Industry Coalition (EPIC) eBook Award for Science Fiction. Winner of the 2016 Readers’ Favorite Gold Medal for Science Fiction: Megalops is an Aquarian, a human-dolphin hybrid who lives in one of the many reef-cities that thrive beneath the waves on an Earth ravaged by climate change. Some of the Humans who cling to the barren lands blame Aquarius for their plight and unleashed the Medusa Plague that entombed Megalops’s wife and daughter in stone. Tormented by that loss, Megalops dedicates everything to avenging his murdered family, no matter what the cost. He unleashes a Vendetta Virus as cruel and lethal as the Medusa Plague, a bio-weapon that transforms living Humans into Aquarian corpses. Ocypode — one of the heroes who stopped the Medusa Plague — and his band of Human and Aquarian allies battle desperate odds to prevent Megalops from committing an act of genocide that will escalate into global conflict, dragging the Earth’s other humanoid species into the chaos. War demands sacrifice. If Mother Earth and Mother Ocean wage war against each other, will anyone survive? Megalops is an Aquarian, a human-dolphin hybrid who lives in one of the many reef-cities that thrive beneath the waves on an Earth ravaged by climate change. Some of the Humans who cling to the barren lands blame Aquarius for their plight and unleashed the Medusa Plague that entombed Megalops's wife and daughter in stone. Tormented by that loss, Megalops dedicates everything to avenging his murdered family, no matter what the cost. He unleashes a Vendetta Virus as cruel and lethal as the Medusa Plague, a bio-weapon that transforms living Humans into Aquarian corpses. Ocypode — one of the heroes who stopped the Medusa Plague — and his band of Human and Aquarian allies battle desperate odds to prevent Megalops from committing an act of genocide that will escalate into global conflict, dragging the Earth's other humanoid species into the chaos. War demands sacrifice. If Mother Earth and Mother Ocean wage war against each other, will anyone survive? In the final installment of the Aquarius Rising trilogy, tensions between Humans and Aquarians have reached the boiling point. In Book 1, Redeemer Edmund Bryce unleashes the Medusa Plague that entombs Aquarian reef-cities in stone as he strives to restore the scorched lands of the Barrens to health at the expense of the oceans. Ocypode, an Aquarian Atavism who serves as Chief Lorekeeper of Phylamook Reef, and his motley collection of comrades manage to stop Bryce and avert disaster. In Book 2, Megalops, an Aquarian biosculptor, is driven mad with grief by the slaughter of his mate and daughter in the wake of the Medusa Massacres. His relentless quest for vengeance leads him to unleash the Vendetta Virus against Redeemer enclaves and causes Aquarius to erupt into civil war.